Are you a teacher using Google Apps? Are you looking for an engaging and authentic computer project to inspire your students? Just this week, TechnoKids announced the most recent technology project designed for Google Apps for Education: TechnoRestaurateur, a unique integrated project that uses Google Sheets, Google Docs, and Google Drawings. 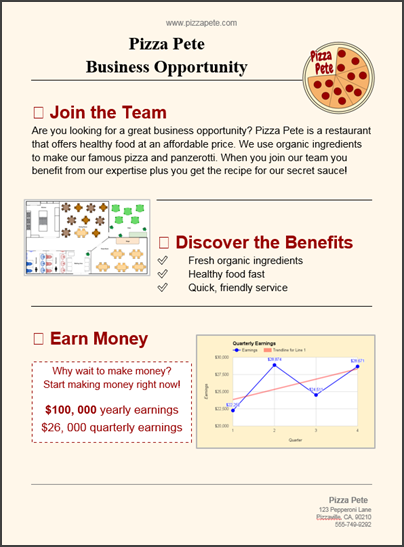 In this project, middle and high school students launch a new restaurant concept, create professional documents, and build practical, real-world spreadsheet skills to analyze the success of their business. Applying critical and creative thinking skills, students begin by conducting a survey of their peers. They organize the data in Google Sheets, create a pie graph, and use the results to make decisions about the restaurant. Then they use Google Drawings to create a company logo. The next step is to write a professional letter with Google Docs in order to raise seed money. With the funding secured, students design a floor plan. 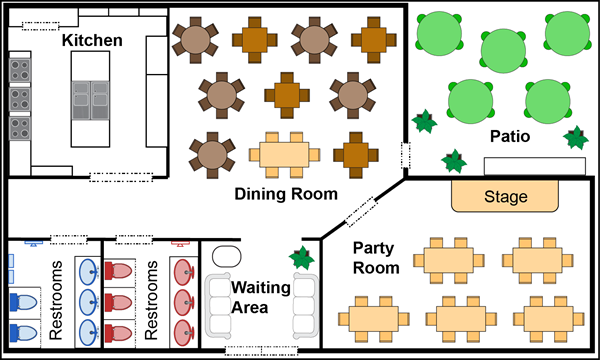 Build graphic skills using Google Drawings to design a restaurant floor plan. Once the restaurant has opened and operated successfully, financial earnings are analyzed. Using Google Sheets, students organize monthly profits and analyze their earnings to develop a business strategy. They calculate and graph quarterly and average earnings and learn how to interpret a trend line to predict future profits. Finally, the business is advertised using a newsletter to potential investors as a franchise opportunity. 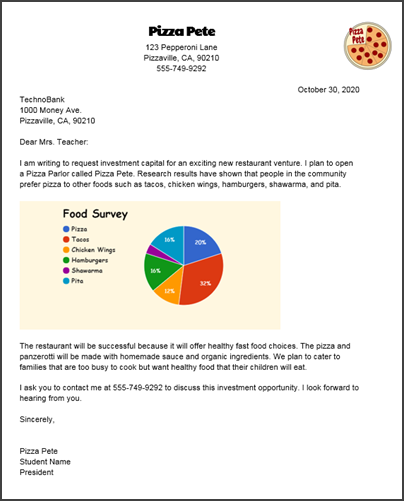 The newsletter includes the restaurant logo, floor plan, and earnings graph to support the promotional text. Checklists in the workbook build organizational skills and help students to ensure that they have completed all parts of the assignments. For teachers, TechnoRestaurateur includes editable marking sheets and a skill summary checklist. Use Functions to Analyze Earnings – Experiment with additional spreadsheet functions to analyze restaurant financial data. Share Your Files with Investors – Create hyperlinks that link to other documents and then share the newsletter with potential investors. Use Google Slides to Advertise a Deal – Design an animated electronic bulletin board to display special offers or upcoming events in the restaurant. Use Google Forms to Rate Opinion – Build a survey about the restaurant. Have peers rate the food, service, menu items, entertainment, or an idea of your choice. Design a rating scale, have peers complete the survey electronically, and then analyze the summary of responses. Read more about TechnoRestaurateur, view learning objectives, and see sample teacher guide excerpts and completed sample projects at Technokids.com.